A warm and dry hiker is a happy hiker! Therefore comfortable walking/hiking boots and socks, a hat or cap, gloves, fleece jacket, water- & wind-proof jacket and over-trousers are essential outerwear. Beneath that a series of lighter mid- and under-layers of clothing are recommended. As a significant portion of the southern section of the route is along small country roads, lighter walking shoes are a useful additional item to carry. If you are new to trail walking then the advice of a specialist hiking gear shop is a necessary pre-embarkation task. If you intend to arrange for back-up luggage to be transported by your chosen accommodation, then a medium size rucksack (25 to 30 litres capacity) will be adequate to carry your daily needs of clothing, food and liquid as well as a basic first aid kit. On the other hand if carrying all your luggage yourself then greater capacity will be needed, the actual size depending on your personal assessment of what are "bare necessities". The entire route of the Wicklow Way is signposted by marker posts, which generally speaking (but not always) are clearly visible. However, it is unwise to embark on the route without a good Guide Book which combines a series of clearly laid out maps, compiled to a known scale, and related descriptive text. 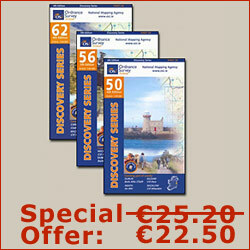 Maps numbered 56 and 62 in The Discovery Series produced by Ordnance Survey Ireland to a scale of 1:50,000, provide a broader topographical picture of the greater part of the route. The northernmost 12km and all of Dublin are on map number 50, the southernmost 1km is on map 61 and the towns of Bunclody and Kildavin are on map 68. Best mountaineering practice recommends carrying a navigation compass (presuming of course you have the ability to use it correctly!) 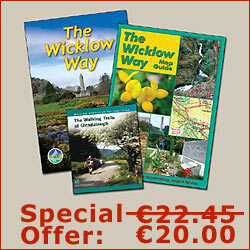 on all hiking expeditions and the Wicklow Way is no exception. Mobile telephone reception is best on high ground, nearly always non-existent in the valleys, therefore regard a phone as an optional extra; useful for contacting your upcoming accommodation in the event of unexpected delay, or in the event of a real emergency (and only in such circumstances) Mountain Rescue.